Tim & Tina's new home building blog - redevelopment in Australia! : Day 261: PCI date confirmed! 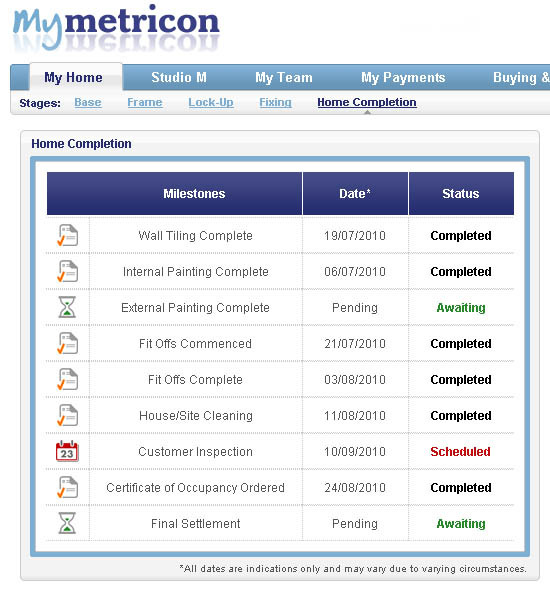 Spoke to our SS yesterday, and it looks like our completion inspection should be going ahead - tomorrow morning! Our inspector went to check out the house back on Day 241, so we're expecting the items from his list to be fixed by now. Alex did make a point to tell us he wouldn't be checking for things like paint defects and other minor cosmetic things, because the painter hadn't come around for final touch-ups at the time of his inspection. So I guess the main things to check tomorrow will be things from Alex's list, plus any paint defects, plus checking things like doors, sinks, drainage, lights, powerpoints etc - basically all the things identified from our earlier post. I've allowed 3 hours before I've got to go back to work in the afternoon :( but we might finish earlier than that if things look good. Also got a bloke recommended by our previous SS dropping in, to give us a quote on sanding & staining our stairs after handover. Been trying to get in touch with our concreter regarding the driveway, but haven't had any contact lately, so not sure if he'll be able to do our driveway & crossover next week. If not, no big deal, we'll get it done sometime after. Still haven't really been able to decide on a colour, we'd like to see real-life examples (rather than just pictures) of the driveway before we confirm our colour selection. And handover? We might have an idea of when we get keys.... but we'll keep you all guessing for now!